I am an apple that doesn’t appear to have fallen far from the tree — well, except for the bicycling. More on that in a bit. As kids, my siblings and I grew up working alongside our parents and learning their work ethic. I only remember ever taking one real vacation with them — a trip we took to the Lake of the Ozarks in Missouri. I must have been 9 or 10. Maybe a little older, but not much. Since then, whenever life has felt overwhelming, I’ve coped by working too much and bicycling as much as possible. But it’s snowing at the moment and I don’t have a job into which to bury myself, so I’ll wrestle my anxiety the best way I know how: By writing about working and bicycling. I rode on the Des Moines Register’s Annual Great Bicycle Ride Across Iowa for the first time in 2008, when I joined the fun for the last two days. The next year, the newspaper (the one I don’t want to name) paid for me to go and I wrote about the experience. But I soon grew to dislike writing and filing stories at the end of the day of riding while everyone else was having fun. The next year, I paid my own way and did not write RAGBRAI stories. THAT is the best way to experience RAGBRAI, but it was also a bit of a challenge on my former salary. So about two years ago, I started working at a part-time job on Saturday and Sunday mornings. That money has mostly financed my bicycling habit, including the past two RAGBRAIs. It also paid my registration fee last week for RAGBRAI XL, which is only 138 days away. Wait a minute. Did he just say he works at a part-time job? Yes. 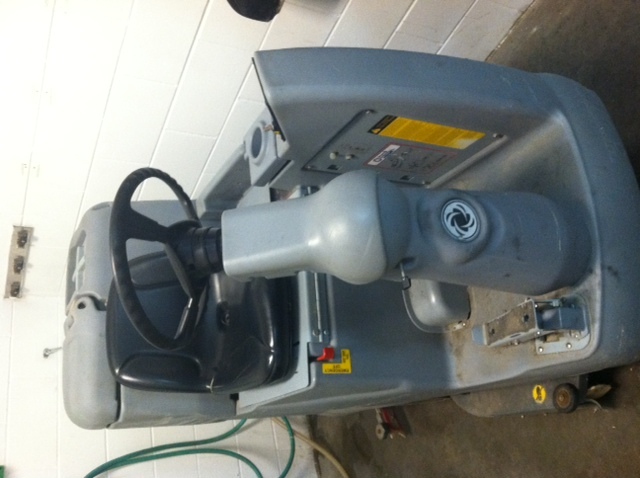 For most of the past two years, my job has been to run what some of my friends call the Zamboni. Actually, it sweeps and mops floors. The other day, I referred to a handful of readers who post anonymous comments on my former newspaper’s website as the nattering nabobs of negativism. And two or three of them had a field day at my expense when they realized a few years ago where I was working on Saturday and Sunday mornings. 1. The people I work with — and for — on Saturdays and Sundays are a great bunch. They laugh and have fun. I’ve not met anyone there I dislike. The company regularly gives raises (which, for me, had become a forgotten concept) and it sends out gifts for every holiday and birthdays. People are treated well there and I like it. 2. There is something about work for me that is Zen-like. No matter what the job, I was taught to give it my best effort and full attention, so that is how I approach the Zamboni. But this weekend, I was especially glad for this diversion. It helped just to have something to do after my first week of not working. My only hope is that it doesn’t stretch into too many weeks or even longer. Last week, a community leader in Muscatine told me better opportunities await, largely because of my work ethic. He commented on my part-time job. It will impress future employers, he said. Check it out: Chris Baldus, a friend and former colleague, has been following my blogging efforts. They have inspired him. Or, so he says. Check out his newest effort here. Contact Steinbach at cs.iowaboy@yahoo.com or follow him on Twitter @csteinbach. Why in the world would the have a field day about where you were working? I think your part time job looks relaxing. Cleaning calms me, so maybe that’s why. Some people must feel so badly about themselves that they will look for anything to try to put others down. How sad. I am glad you like your part time job. I have always worked a bunch of jobs, in addition to full-time teaching jobs: piano teacher, church musician, professional accompanist, art framing consultant (one of my favorites, because it was so different from anything else I do!) Because of this, I’ve rarely felt guilty when I indulged myself, and many times it made the difference in our budget. I feel sorry for people who just go to work, come home & watch TV, go to bed, and do it all over again. Blah! I love this story. And while you probably took the job originally to help finance bike riding, etc, I’ve found that building, cleaning, or fixing something really makes you feel good 🙂 I was going to say I didn’t understand why somebody would be critical of you having a second job, but these people are thos who search for the bad in everything, so it’s not surprising. You can only pity those kind of people. When you have to tear somebody else down to make yourself feel better, it’s very sad. What’s NOT sad is your “give it your all” attitude, no matter what you’re doing.